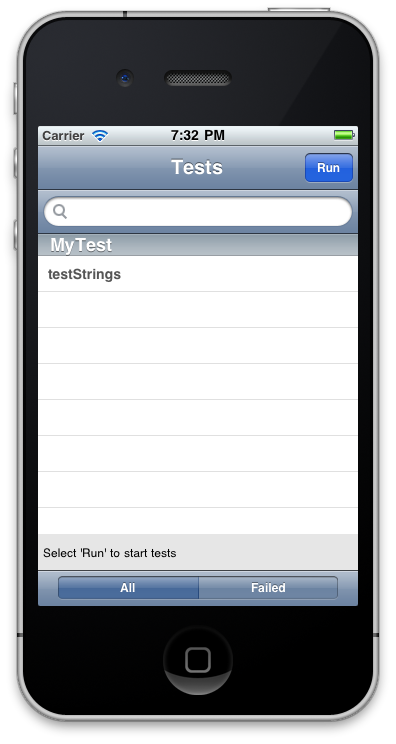 Select Objective-C class (iOS, Cocoa Touch or Mac OS X, Cocoa) and select Next. Leave the default subclass and select Next again. 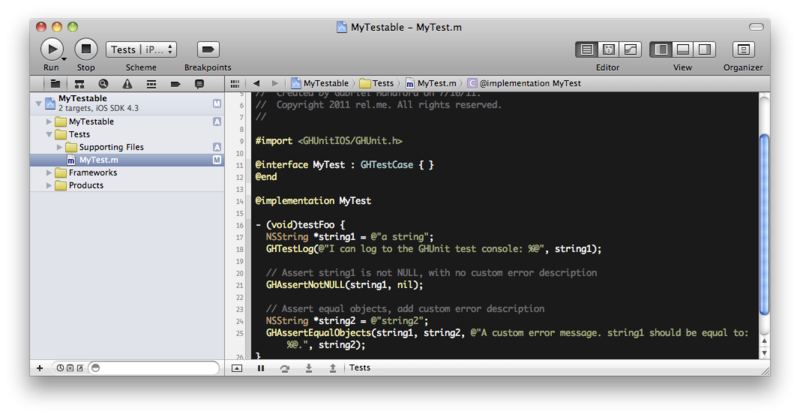 Name the file MyTest.m and make sure its enabled only for the “Tests” target. Delete the MyTest.h file and update the MyTest.m file. Now run the “Tests” target. Hit the Run button in the top right. // By default NO, but if you have a UI test or test dependent on running on the main thread return YES. // Also an async test that calls back on the main thread, you'll probably want to return YES. // Call prepare to setup the asynchronous action. // action occurs before the wait is actually called. // we will throw an error. // Notify of success, specifying the method where wait is called. // This prevents stray notifies from affecting other tests. The following test macros are included. These macros are directly from: GTMSenTestCase.h prefixed with GH so as not to conflict with the GTM macros if you are using those in your project. The description argument appends extra information for when the assert fails; though most of the time you might leave it as nil.